I made up this display of dug relics, after a friend and I went metal detecting on a farm that connects to the Perryville Ky battlefield. The farm is privately owned by a friend that I work with. A Civil War hospital once stood on this farm, but has since burned down. Most of the artifacts shown were recovered close to where the hospital once stood. 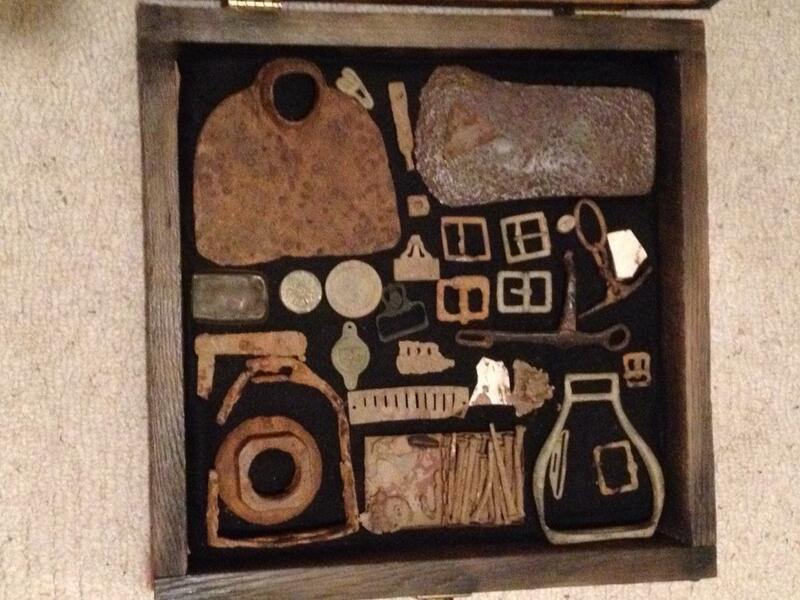 Shown in the picture is a brass and iron stirrup, parts of a pocket watch, some reeds from a harmonica, an entrenching hoe, a blacksmith forged ax head, several buckles, snuff box, a pocket knife, a nice US Calvary horse bit medallion, a couple bridal rosettes, some suspender buckles, a wagon axle nut, and a hand full of square nails. A lot more was recovered, and hopefully I will have another display for it soon. It is the greatest feeling to be able to recover a piece of history that has been buried for over 150 years.